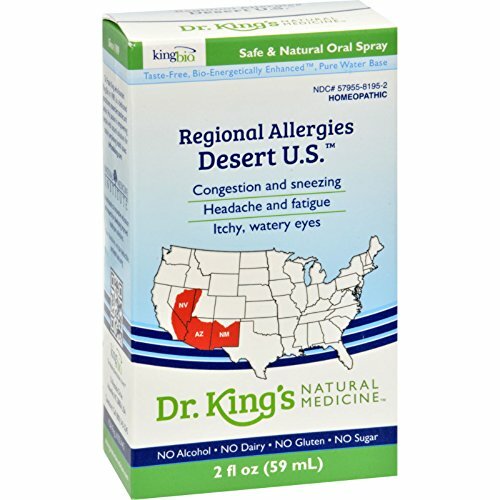 King Bio Homeopathic Southwestern U.S. Description: Revolutionary Taste Free Medicine. 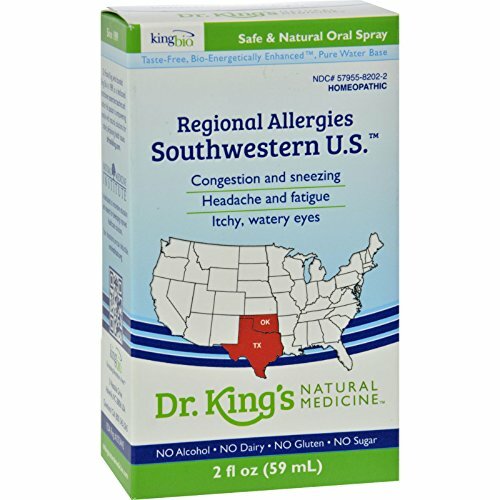 No Side Effects Regional Allergies Homeopathic Natural MedicineINDICATIONS: For fast relief of the following symptoms: itch, watery eyes sore throat, cough hoarseness, fatigue runny nose sneezing congestion headachesFrom allergens found in OK, TX. Disclaimer These statements have not been evaluated by the FDA. These products are not intended to diagnose, treat, cure, or prevent any disease. 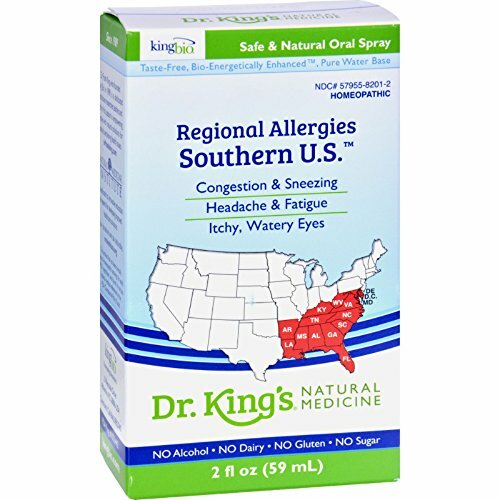 King Bio Homeopathic Regional Allergies Southern U.S. Description: Revolutionary Taste Free Medicine. No Side Effects. Indications For Fast Relief of: Itchy, Watery Eyes Sore Throat, Cough Hoarseness, Fatigue Runny Nose Sneezing Congestion Headaches From Allergies Found in AR, LA, MS, AL, GA, FL, TN, KY, WV, VA, NC, SC, MD, DE, District of Columbia (DC) Disclaimer These statements have not been evaluated by the FDA. These products are not intended to diagnose, treat, cure, or prevent any disease. 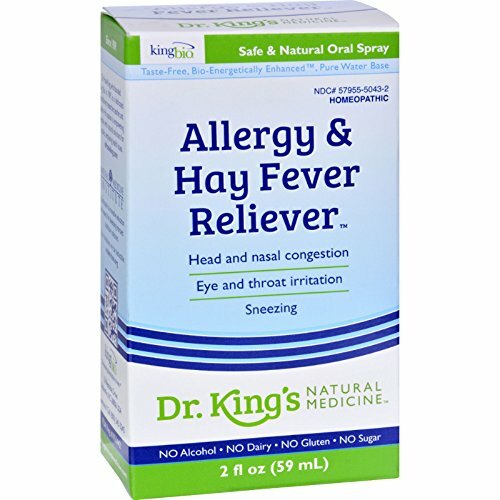 King Bio Homeopathic Allergies and Hay Fever Description: For fast relief of head and nasal congestion; mucus discharges; sneezing; cough; hoarseness; sore throat; red, itchy or watery eyes; sensitivity to light; ears that ring or itch; dry mucus membranes or lips. Disclaimer These statements have not been evaluated by the FDA. These products are not intended to diagnose, treat, cure, or prevent any disease. King Bio Homeopathic Allergies and Hay Fever Description: For fast relief of head and nasal congestion; mucus discharges; sneezing; cough; hoarseness; sore throat; red, itchy or watery eyes; sensitivity to light; ears that ring or itch; dry mucus membranes or lips. Disclaimer These statements have not been evaluated by the FDA. These products are not intended to diagnose, treat, cure, or prevent any disease. 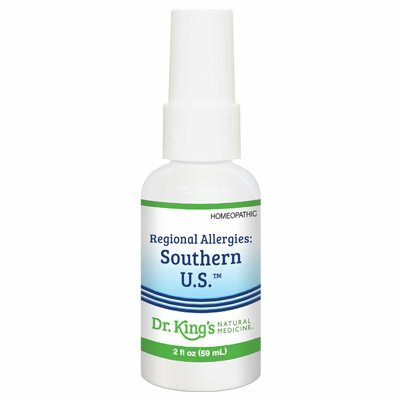 King Bio Homeopathic Allergies and Hay Fever Directions Before initial dose, depress pump spray 4-5 times to prime. Hold close to mouth and spray 1 dose directly in mouth 2 to 6 times daily until symptoms improve. Adult dose: 3 pump sprays Child's dose (2yrs-12yrs): 2 pump sprays Infant dose (Newborn-2yrs): 1 pump spray Ingredients: Allium Cepa ambrosia artemisiaefolia, arsenicum album, arundo muritanica, arum triphyllum, euphrasia officinalis, sabadilla, naphthalinum, natrum muriaticum, wyethia helenioides. Each ingredient is in equal volumes of 10x, 30x, and 100x potencies in a pure water base. Inactive ingredients: citric acid and potassium sorbate. 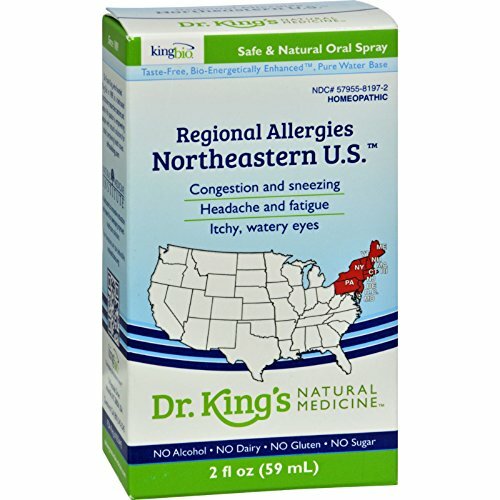 King Bio Homeopathic Northeastern U.S. Description: Revolutionary Taste Free Medicine. No Side Effects Regional Allergies Homeopathic Natural MedicineINDICATIONS: For fast relief of: itchy, water eyes sore throat, cough hoarseness, fatigue runny nose sneezing congestion headachesFrom allergens found in ME, NH, VT, MA, CT, RI, NY, NJ, PA, DE, MO, DC Disclaimer These statements have not been evaluated by the FDA. These products are not intended to diagnose, treat, cure, or prevent any disease. Indications for use: For red, itchy, watery eyes, sore throat, cough, hoarseness, fatigue, runny nose, sneezing, congestion and headache from grass, trees, weeds, pollen and mold in AZ, NM, and desert areas of UT, CO, CA, and NV. Description:Allergies: Dust, Mite & Roach 2oz is available by SafeCare Rx / King Bio, Inc.Congestion, itchy, watery eyes, asthma, difficulty respiratory, skin irritation, sneezing, coughing, muscle, joint pain and fatigue from reaction to dust, mites, roaches.Hold close to mouth and spray 1 dose directly into mouth 2 to 6 times daily until symptoms improve. Before initial dose, depress pump 4-5 times or until primed.Adult Dose: 3 complete pump spraysChilds Dose (2-12 years): 2 complete pump spraysNewborn (up to 2 years): 1 complete pump sprayExternal use (when appropriate) Simply spray on affected areas 2 to 6 times daily until symptoms improve. Brand: SafeCare Rx/King Bio, Inc.
Biochemic combination tablets 1-28? ?Homeopathic medicine!! 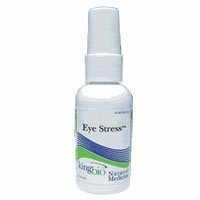 Compare prices on King Bio Homeopathic Eye at ShopPlanetUp.com – use promo codes and coupons for best offers and deals. We work hard to get you amazing deals and collect all available offers online and represent it in one place for the customers. Now our visitors can leverage benefits of big brands and heavy discounts available for that day and for famous brands.